Dr. Deavers received his MD from the Louisiana State University School of Medicine in New Orleans in 1989. 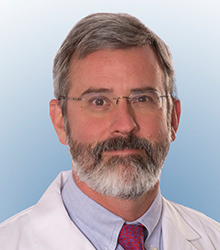 After completing an anatomic and clinical pathology residency at the Walter Reed Army Medical Center in Washington, DC, in 1994, he completed his surgical pathology fellowship at the MD Anderson Cancer Center in Houston, Texas. Dr. Deavers joined the faculty at the MD Anderson Cancer Center as an instructor in the Department of Pathology in 1997. He became Professor of Pathology in 2007. In 2014, Dr. Deavers was recruited to the Department of Pathology and Genomic Medicine at the Houston Methodist Hospital. Dr. Deavers is the Co-Director of Immunohistochemistry and the Director of the Women’s Health fellowship at the Houston Methodist Hospital. Prior to joining the Methodist Hospital, Dr. Deavers served first as a Co-Medical Director, and then as the Director of the Immunohistochemistry Laboratory at the MD Anderson Cancer Center from 2005-2014. Additionally, Dr. Deavers was the Director of Clinical Operations in the Department of Pathology and Laboratory Medicine at MD Anderson from 2010-2014. His dedication to the field of pathology research has been recognized by a number of awards, including the Russell L. Holman Memorial Pathology Award and his recognition as one of the Best Doctors in America. Dr. Deavers is board certified in anatomic and clinical pathology. His research interests include gynecologic pathology and immunohistochemistry. His research interests include gynecologic oncology and sarcoma. Deavers, M & Miller, RA 2018, . in I Ramzy, D Mody & R Laucirica (eds), Clinical Cytopathology: Fundamental Principles and Practice. 3rd edn, McGraw Hill Education, pp. 755-788. Do Skin Lacerations Imply Tissue Transfer From Surgeon to Patient During Arthroscopic Knot Tying? Hypertensive Emergency Following Embolization of a Large Adrenal Myelolipoma_Adrenal Medullary Infarction, Pheochromocytoma or Acute Sympathetic Discharge? Does ifosfamide therapy improve survival of patients with dedifferentiated chondrosarcoma?